Eating gluten-free doesn't necessarily mean giving up pizza thanks to this healthy recipe. Riced cauliflower mimics the texture of flour, and when blended with Italian herbs and shredded mozzarella and Parmesan cheese, it makes for a flavorful, no-carb base for your favorite pizza recipe. The vegetable mixture is bound together with an egg, and rolled out like traditional crust. 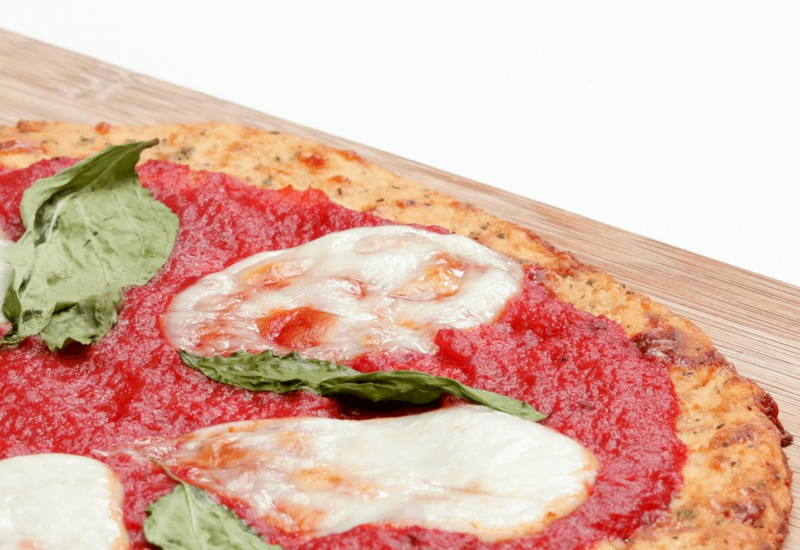 It's delicious baked simply with tomato sauce, creamy fresh mozzarella cheese and basil. Don't forget to drizzle the finished pizza with olive oil and season with flaky sea salt! The cauliflower crust is easily customizable: Add a tablespoon of almond meal to the crust with the cheese to give a slightly nutty flavor. Add a pinch of crushed chili flakes if you want a bit of heat, or a teaspoon of lemon zest for a little acidity. Per Serving: 100 calories; 6g fat; 5.5g carbohydrates; 8g protein; 59mg cholesterol; 336mg sodium. This recipe is soooo yummy, and the cauliflower actually holds together like a real pizza crust, as opposed to crumbling like other cauliflower pizza crusts I've tried. There is definitely a hefty portion of cheese in the crust, so I actually just didn't put any cheese on top - just red sauce and veggies - and this was a lovely weeknight dinner! This successfully tricked my toddler into eating vegetables, which is the highest compliment that I could possibly give. When I made this, I was worried because the cauliflower smells gross, but the smell clears after initially steaming it, and the pizza doesn't have a strong cauliflower taste at all. I've tried recipes like this in the past, and they always fell apart. I think it was because I didn't get enough moisture out of the dough. I've made a few of these cauliflower crusts before and this recipe holds up really well - the key to a good crust is getting as much moisture out of the cauliflower rice as you can before mixing it in with everything else, a masticating juicer works great for that. Next time I have my gluten sensitive friends over, I'm excited to whip this up for them. I have a love hate relationship with gluten free pizza crust, but this isn't bad at all! Instead of using dried oregano and basil, I used a basic store-bought Italian seasoning blend. Next time I make this I want to modify to make vegan (without egg and cheese). I topped with this pizza with fresh, whole basil leaves and tomato sauce. It was delicious, loving the low carbs!